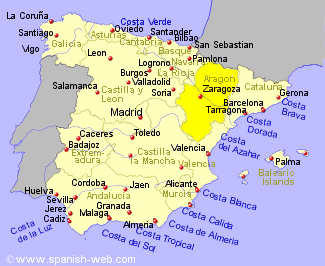 The Spanish region of Aragon is landlocked, and except for the Pyrenees at the north, largely featureless and unatractive to visitors, yet full of history. Huesca, the most northerly of Aragons 3 regions and also has important wine growing areas upto the foothills of the Pyrenees. The Ordesa National Park includes one of the highest peaks in the Pyrenees. Teruel is the most southerly of the regions 3 provinces and lies 50 Km inland from the Costa de Azahar and the Costa Dorada. The area known as Matarraña, named after a river that flows there, separated from the Ebro Valley by the Dels Ports Natural Park, is home to some particularly stunning villages. Looking very ordinary as you approach them, in the centre you will find magnificent architecture on a grand scale. The area is off the main tourist track but has attracted many artists in the past, including Picasso, who spent some time at the village of Horta de Sant Joan. 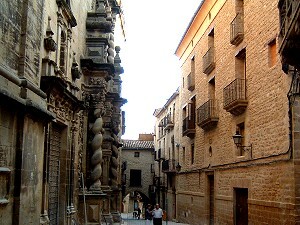 Zaragoza is home to the city of Zaragoza, the capital of the region and also has some important wine growing areas. The city has been important for it's crossing of the River Ebro and has an impressive Morish palace, the Aljafería, plus two cathedrals.